Trends, hard limits, and alarms have been used for years to signal that a patient is currently deteriorating. HeRO is different. 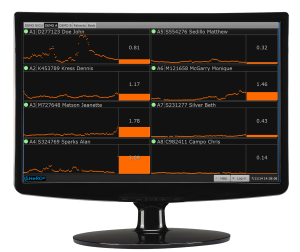 HeRO identifies subtle irregularities in heart rate variability that occur hours and days prior to patient deterioration and provides an early warning of patient distress, including sepsis1,2, NEC2,3, UTI1,4, meningitis4, respiratory decompensation2,5,6, brain pathology7,8,9, and death1. And unlike any other monitoring technology available, HeRO has been proven in the most rigorous scientific fashion to improve survival 10. Released very early in infection, cytokines are the mediators of the inflammatory response. They have effects throughout the body, including the way the pacemaker of the heart responds to the autonomic nervous system. During the early stage of infection and other inflammatory events, characteristic abnormal heart rate patterns occur that HeRO has been trained to identify, and HeRO renders a score every hour that is the risk of infection in the next 24 hours11. There is a large body of literature demonstrating that delays in antibiotic administration can increase mortality and morbidity12,13,14,15,16. Researchers hypothesized that by improving the timing of the diagnosis, HeRO monitoring might improve outcomes for NICU patients. They conducted the largest ever randomized control trial in neonatology, where 3,003 very low birthweight babies were randomized to either receive standard of care, or standard of care plus HeRO. For patients in the HeRO monitored group, there was at least an 18 hour average difference in the timing of the rise in HeRO score relative to the diagnosis. And if the antibiotics can be started that much earlier, the infection can be nipped in the bud—before it goes systemic, before organs start shutting down, before the really bad outcomes occur. The HeRO monitored group benefitted from a 22% reduction in mortality. For infected babies, the mortality improvement was 40%16, and their length of stay was decreased by 3.2 days17. And there was no increase in antibiotic usage for healthy babies16. Trends and limits tell you what is happening. HeRO is an early warning system that tells you what is going to happen. HeRO…Because timing is critical. HeRO Symphony sets the paradigm for the HeRO System. It is the most advanced form of HeRO available. 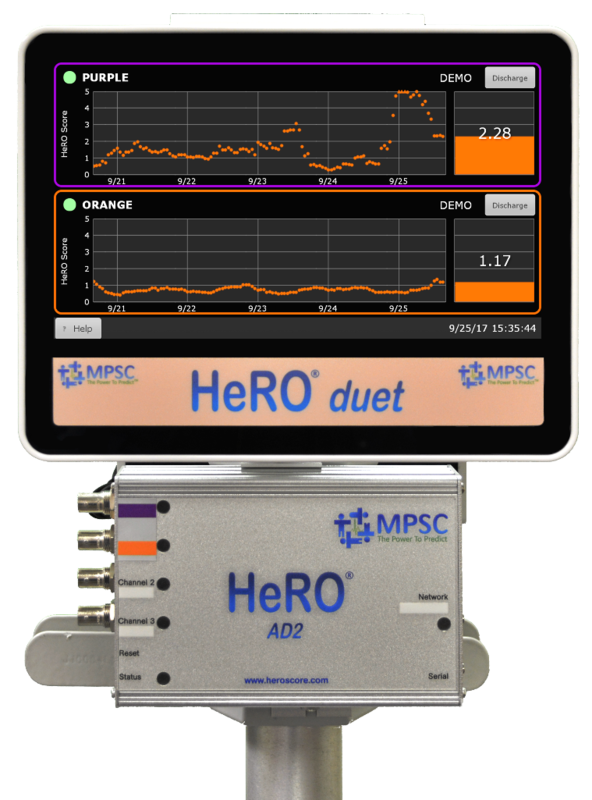 HeRO solo & HeRO duet are cost effective bedside solutions when central monitoring isn’t desired. Designed to address the desire for a HeRO monitor in the patient room, HeRO solo and HeRO duet meet the need! 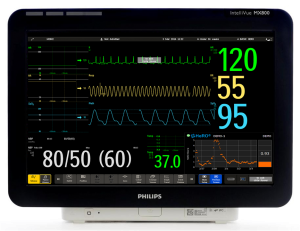 HeRO ES is an embedded HeRO System that can run within specific Philips Intellivue MX monitors! 1 Heart Rate Characteristics: Novel Physiomarkers to Predict Neonatal Infection and Death, Griffin, et al. Pediatrics 2005. 2 Infection and Other Clinical Correlates of Abnormal Heart Rate Characteristics in Preterm Infants. Sullivan et al, JPeds 2014. 3 Abnormal heart rate characteristics before clinical diagnosis of necrotizing enterocolitis. Stone et al. Journal of Perinatology 2018. 4 Urinary tract infection, meningitis, and septicemia in VLBW infants enrolled in a heart rate characteristics monitoring trial. Weitkamp, et al. ABSTRACT: PAS 2018. 5 Predictive monitoring for respiratory decompensation leading to urgent unplanned intubation in the neonatal intensive care unit. Clark, et al. Pediatric Research 2013. 6 Predicting Extubation Outcomes-A Model Incorporating Heart Rate Characteristics Index. Goel et al, JPeds 2018. 7 Abnormal heart rate characteristics are associated with abnormal neuroimaging and outcomes in extremely low birth weight infants. Fairchild, et al. J Perinatology 2014. 8 Depressed Heart Rate Variability is Associated with Abnormal EEG, MRI, and Death in Neonates with Hypoxic Ischemic Encephalopathy. Vergales, et al. Am J Perinatol 2013. 9 Heart rate characteristics and neurodevelopmental outcome in very low birth weight infants. Addison K et al. J Perinatology 2009. 10 Mortality Reduction by Heart Rate Characteristic Monitoring in Very Low Birth Weight Neonates: A Randomized Trial. Moorman et al. J Pediatrics 2011. 11 HeRO monitoring to reduce mortality in NICU patients. Fairchild KD, Aschner JL. P Research and Reports in Neonatology 2012. 12 Duration of hypotension before initiation of effective antimicrobial therapy is the critical determinant of survival in human septic shock. Kumar et al. Crit Care Med 2006. 13 Efficacy of adequate early antibiotic therapy in ventilator-associated pneumonia: influence of disease severity. Clec’h et al. Intensive Care Med 2004. 14 Outcomes analysis of delayed antibiotic treatment for hospital-acquired Staphylococcus aureus bacteremia. Lodise et al. Clin Infect Dis 2003. 15 Antibiotic treatment delay and outcome in acute bacterial meningitis. Køster-Rasmussen et al. J Infect 2008. 16 Septicemia mortality reduction in neonates in a heart rate characteristics monitoring trial. Fairchild et al. Pediatr Res 2013. 17 Neonatal Intensive Care Unit Length of Stay Reduction by Heart Rate Characteristics Monitoring. Swanson et al. JPeds 2018.